A house of two halves, the older part of The Boathouse started life in the Victorian period. The original red brick cottage has been thoughtfully renovated, retaining its period charm, and then cleverly linked via covered walkways to the modern half of this unique building. Built largely of recyclable materials, triple glazed and with solar panels, the new ‘eco house’ stands on stilts in contrast to its Victorian counterpart. The open-plan living space is beautifully designed and has English oak floors, a vaulted ceiling and glass walls facing east and west to make the most of the views and the natural light. Accommodation comprises: two bedrooms, two bathrooms, kitchen/breakfast room and study, plus further reception rooms. The cottage has a living room, master bedroom and bathroom. Outside are pretty gardens, 300m of water frontage plus moorings, and 600m of fishing. 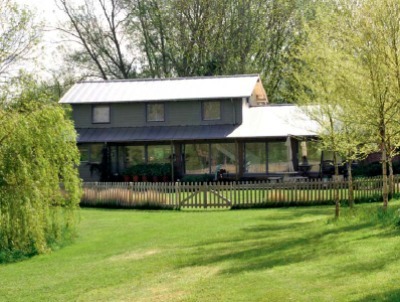 Standing in over three acres of tranquil surroundings between the River Kennet and the Kennet & Avon canal, The Boathouse occupies a truly unique location. With 600m of fishing and 300m of canalside moorings, the property has a rural outlook. Situated in a conservation area and surrounded by its own land, wildflowers and wild fowl are in abundance. The design and situation of the house allows the occupier to experience the changing light and views throughout the seasons as it sits in harmony with its surroundings. Newbury station is just half a mile from where trains to London Paddington take about 50 minutes. The guide price is £1.2m. For further information please contact Strutt & Parker on 01635 521 707 or visit www.struttandparker.co.uk.